Lots of DevOps news this week, including why automation is critical for securing code, as well as balancing agility with security needs. Learn how to manage security in GitHub projects with CoPilot from Black Duck Software. Pre-GDPR, Carphone Warehouse gets hit with £400k fine over a 2015 hack. And why you should think like your attackers when developing your cybersecurity portfolio. 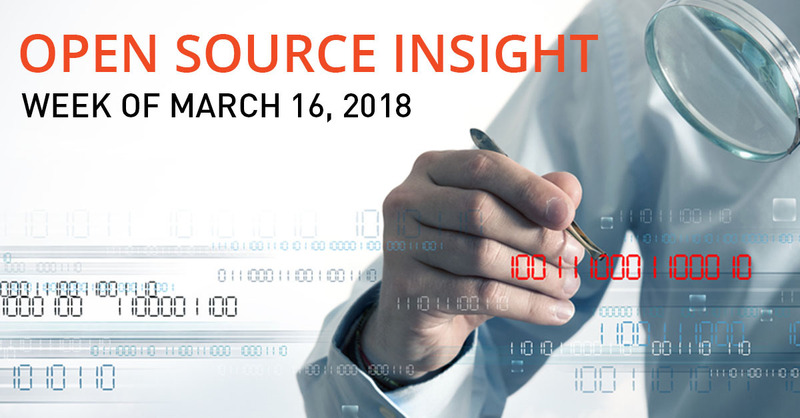 Read on for this week’s cybersecurity and open source security news in Open Source Insight! via CA Technologies: According to security company Black Duck Software, now part of Synopsys, open components are used in 96 percent of all proprietary applications. On average, a total of 147 different open components are used in an application. Most important from a safety standpoint is that 67 percent of all applications use components that have known vulnerabilities. via Synopsys Software Integrity blog (Lisa Bryngelson): CoPilot is a publicly-facing free application that allows owners of open source projects on GitHub to monitor security risk associated with used components as part of their Git Flow development process. via GovTechWorks: Performing a manual, detailed security analysis of each open-source software component takes hours to ensure it is safe and free of vulnerabilities. Tools from Sonatype, Black Duck of Burlington, Mass., and others can automate most of that work. via V3: Carphone Warehouse used ‘out-of date software and failed to carry out routine security testing’, says ICO. via Synopsys Software Integrity blog (Phil Odence): The Black Duck audit business is built on trust, doing great work, and, critically, responsiveness. We pride ourselves on “moving at the speed of transactions.” As part of a large public company, can we remain as amazingly responsive as we have been to client needs? Yes! via Forbes: The pressure on development teams to become agile and work at DevOps speeds has led to an increase in the use of open-source software. However, a hidden danger in increasing reliance on software you haven’t developed is that it typically carries with it performance and security risks, which must be properly identified and fixed before an application goes into production. via Synopsys: Five-member board of experienced security executives to guide technical innovations of Synopsys security products and services. via Forbes: When you have third-parties that are providing services to you, that’s a much different threat model, because then you have to ask what if someone actually attacks the third-party provider and we’re using their software in our architecture? What if someone taints the supply chain and actually puts rogue code into our code base? Read more Software Integrity news – subscribe to the blog.